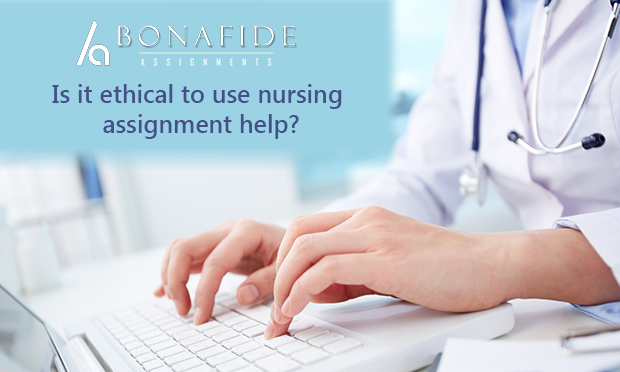 Home > Nursing Assignment > Is it ethical to use nursing assignment help? Without getting into the technicalities, let us use an example to simplify the concept of taking help in nursing assignments. Imagine that you are learning a foreign language. Taking the help from an expert in intricacies of the language does not mean that you have cheated. You still have to read and practice the language yourself in order to become efficient. Similarly, acquiring help in nursing assignment is merely a guide for students. It can be considered ethical as the entire curriculum of nursing is practical. At the end of the day, people choose to become nurses because they genuinely want to help others. No one can teach you empathy or kindness. No one can teach you hard work. However, nurse assignment help can act as a friend, guiding you in the correct direction. Sometimes, despite their best efforts, students fail to understand textbooks. This is because majority of the textbooks are written in a complicated manner. The technicalities of nursing are so complicated, that sometimes even the students who are proficient in English are stumped. Nursing assignment help serves as a bridge, helping students understand complicated topics by breaking them into easily understandable components. By breaking complicated topics into easily understandable components, assignment helps increases the recall value of the topic. Hence, it not only increases the subject knowledge of the student, but helps them become more productive during viva and examinations. Sometimes, as a result of hard work, students grasp the basic concepts in textbooks. However, they are unable to do justice to their nursing assignments as they are not competent with academic English. Academic English is very different from everyday language that we use. Here, we have to speak in third person, without venturing into stylised English. Therefore, nursing assignment help serves as a template for students, guiding them in to the arena of academic English. In addition, nursing is a broad, dynamic and ever changing field. There no single textbook that accurately summarises the different concepts of nursing. Moreover, since advancements take place on a daily basis, it is easy for students to lose track. By acquiring help in nursing assignments, students are guaranteed better grades as no important information is omitted. Finally, students are always struggling to juggle between assignments, hospital time and vivas. By taking help, students are relieved of academic stress. They can relax and concentrate on their practical work as they know that their work is in good hands. As a consequence, the quality of the patient care that they deliver improves. Isn’t this the actual goal of nursing? Concentrating on improving the quality of care? Bonafideassignment empathises with the plight of nursing students, and this is the reason why we are hundred percent committed in delivering quality work to you. We are not in the business to make money, but to make better nurses. At the end of your course, we guarantee you that you will consider us your best friends and saviour.